Grilled beef tenderloin is served on many restaurants in Sweden. The favourite sauces to accompany it are either Béarnaise sauce or a wine reduction sauce with herb butter. Salt and pepper the tenderloin. Peel the shallots. Heat up a grill pan over medium heat and add the vegetable oil. Grill the tenderloin and the shallots to the desired doneness. Let the tenderloin sit under some tin foil for 5-7 minutes before serving. De glaze the pan with 100 ml (3.38 fl oz) water and save for the wine reduction sauce. Chop the onion and tarragon very fine. Fry it for 5 minutes in 10 g (0.35 oz) of the butter. Let it cool down. Add the tarragon and onions to the rest of the butter. Mash the butter with a fork and then transfer it to a piping bag with a star tip. Pipe the butter onto some baking paper and then refrigerate the butter until serving. Use a large pot to reduce the wine and pan jus from the beef. Let the wine reduce to 250 ml (8.45 fl oz). Let the wine sauce cool down and transfer it to a piping bottle. Heat two pans over medium heat and add half of the butter to each pan. Make 4 stacks of potatoes and press them down with a spatula. Lower the heat to medium/low and fry on both sides until golden brown. Add the salt and put the potatoes on a piece of kitchen paper do drain excess fat. Place one hash brown potato on the plate. Cut large pieces of the beef tenderloin and place onto the potatoes. Add the tarragon butter on top of the tenderloin. 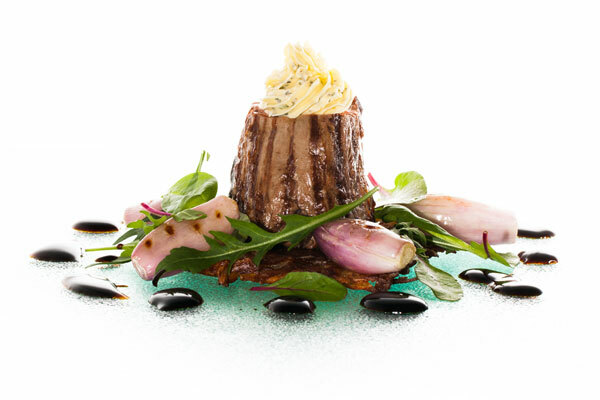 Arrange the shallots and micro greens around the beef tenderloin. Drip the wine reduction sauce around the potatoes.